1. What is the SHG approach? The Self Help Group (SHG) approach is a potent development model that recognizes poverty as extending beyond mere material deprivation to constitute a continuous process of disempowerment. It aims to uplift individuals and communities from a place of poverty and hopelessness to a state of empowerment and optimism. 2. What are People’s Institutions? By People’s Institutions, we refer to the three tiers of the SHG approach viz. the Self Help Groups, the Cluster Level Associations and the Federations. Self-Help Group (SHG) is an informal association of poor women in a community with a common objective of working together for their economic and social and overall empowerment. SHG consists of 15 to 20 members, generally homogeneous and bound by affinity. Promoting organization usually use the Participatory Rural Appraisal technique to facilitate wealth ranking by the community when forming the SHGs. When SHGs grow in number and begin to realize that there are problems they cannot solve without the help of other groups, they are prepared to form a cluster of self-help groups or a Cluster Level Association (CLA). Generally, when there are about 8 to 10 strong SHGs, the groups come together to form a CLA (the second level of the People’s Institution). Two members are carefully selected by the SHG members from among themselves to represent their group at the CLA. Thus a CLA is made up of 2 representatives from each of the SHGs that are part of the CLA. As more and more SHGs are formed, there are more CLAs established. When there are about 8 CLAs, they come together to form a Federation (the third level of the People’s Institution). Their roles consist of taking over the role of the promoting NGO and build a strong People’s Institution; providing need-based services to the community; working towards peace, security, and justice in the community and positively influencing People’s thinking and policies. 6. Is homogeneity a key criterion for forming SHG’s? Yes, socioeconomic homogeneity is intrinsic to the process of forming SHGs. The screening process, Participatory Rural Appraisal (PRA) that takes place at the start of the group’s formation ensures that the women grouped together are from a similar socio-economic background alongside other criteria pertaining to homogeneity. In heterogeneous groups, there is a great likelihood for the most empowered women to dominate the group and thwart the potential achievements of the group. 7.Is it possible to replicate the self-help approach amongst men groups? Although it is possible to replicate the self-help approach amongst men, the most ubiquitous SHGs are women groups as promoted by CoSAP. This is attributed to the many issues and prominent challenges associated with the variation in the patterns of saving, spending, meeting and discussion between men and women. 8. Do SHG promoting organizations provide startup capital or seed money to SHGs? This is the major component that distinguishes the SHG approach from other intervention strategies. Promoting organizations do not provide financial assistance or any other form of handout to the women in the groups, though they target the poorest of the poor. Therefore, the role of the promoting organization constitutes facilitating the formation of the SHG groups and endowing them with handholding capacity (soft) support, The women will begin saving in groups on a small scale, whereby capital will accumulate and become a readily available source of funding for internal lending, free of any collateral. 9. How do the women groups become economically empowered? And is it sustainable? The SHGs focus on saving mechanisms to generate financial capital. These women groups initially begin saving on a small scale and slowly increase their savings, thereby augmenting their capital. Funds are also generated through charging service fees on the loans taken out by individuals. These loans which are readily available and collateral free are used to finance business ventures which directly work towards increasing their financial standing. Furthermore, as the demand for more funding comes, the economic empowerment is also derived from the linkages to microfinance made by the CLAs. Therefore, since the SHGs depend on their pooled financial resources for economic betterment, they avoid getting entrapped in a cycle of dependency and are instead able to develop in a sustainable manner. 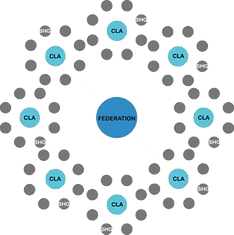 10.Why are Cluster Level Associations (CLAs) and Federations necessary? Is forming SHG’s not sufficient? As a holistic development intervention, the SHG approach tries not only to address the problems at the individual level but also attempts to tackle all the disempowering obstacles that women face at the community and societal level. Therefore, forsaking the approach after forming the SHGs will force the women to become mired in the generational problems passed onto them. The CLAs – as clusters of the groups will strive to address community issues while the Federations dedicate their efforts to remedying societal problems. 11. Is it necessary for SHGs to become officially registered entities? The lessons from the best practices elsewhere in the world indicate that People’s Institutions have an informal structure. But this does not mean that they should not be well-recognized. Currently, there is no legal framework that enables People’s Institutions to deliver their unique roles and functions in the country. Therefore, CoSAP and its members work together to advocate for such legal framework. 12. What is CoSAP’s role in the SHG approach? CoSAP doesn’t engage directly in the formation of Self Help Groups and other tiers of People’s Institutions. As a consortium, its major roles fall in the areas of: Capacity building of member organizations to ensure the adequate implementation of the SHG approach; providing technical support to members in the areas of program design and implementation; financing, and monitoring and evaluation. In addition, CoSAP is involved in the publishing and documentation of vital information that is crucial to promoting the approach amongst policy makers and donors. 13. Who can join CoSAP as a member? Ethiopian Resident Charities who are promoting the Self Help Group Approach as a core strategy for women’s empowerment and supporting the cause for children can apply and join as a member. In addition, other likeminded individuals and organizations can also join as associates or affiliates. The membership requires an appraisal by the Board and approval by the General Assembly. 14. Does CoSAP offer funding opportunities to member organizations? The very essence of forming CoSAP as an umbrella organization is to consolidate efforts for capacity building, learning, and shaping an atmosphere that is conducive to the promotion of the Self Help Group approach. This being the reality; CoSAP also utilizes its efforts to support some of its member’s access to funding opportunities by designing projects and enabling their implementation through joint action.